Grain-free Peanut Butter Cookie Brownies made with all gluten-free, dairy-free and refined sugar-free ingredients! 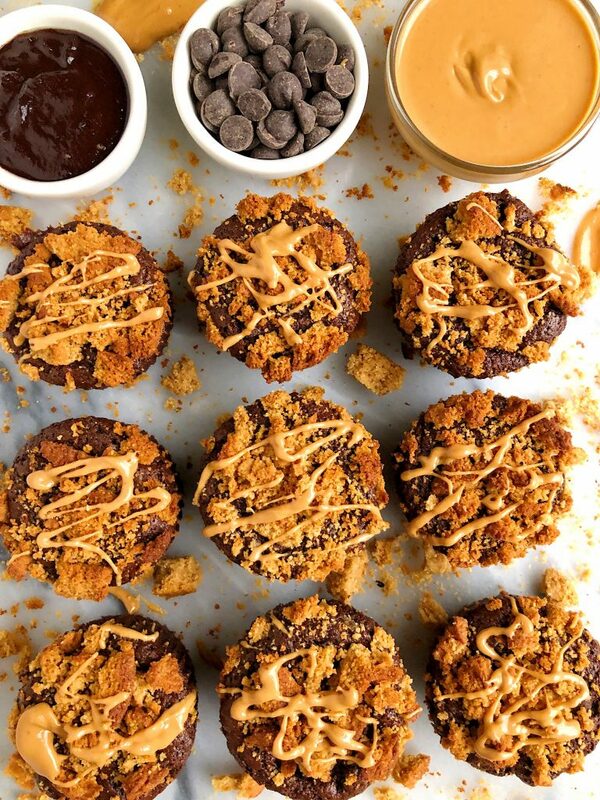 These Fudgey brownie cups are topped with a crunchy peanut butter cookie topping for an extra peanut buttery flavor! Remember when we made those Gluten-Free Chocolate Chip Cookie Brownies aka “brookies” and everyone started to go crazy?! Ya, we are back today with a NEW brookie recipe for you. Except this time there are a few new twists on the original recipe I shared. For starters, this recipe is about 85% brownie and 15% cookie. I wanted to make something a little more decadent and chocolate-y than the usually half cookie/half brownie portion in a brownie cookie recipe. Plus the brownie in this is a lot fudgier than usual. It’s almost like a moist cake of sorts and when you bake it in cupcake/muffin form, it really makes it even more cakey than I imagined – I am obsessed! The brownie in this is also grain-free, gluten-free and dairy-free. I use a mix of almond flour, cacao powder and melted dark chocolate (along with a couple other goods) to get that extra dense and chocolate-flavor. 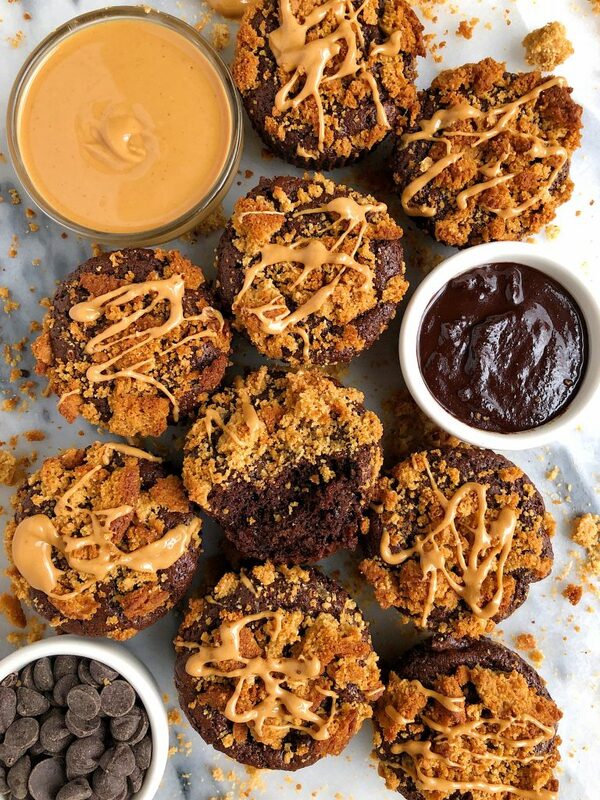 But now let’s chat about the peanut butter cookie topping. Some may say this is “cheating” but I personally think this is one of the smartest baking hacks ever. As someone who spends a lot of time in the kitchen testing all different things, I love making most things from scratch. But there also comes a time when you are in a rush or just don’t feel like making cookies from scratch and I don’t blame you. As a soon-to-be Mom, I have a feeling that will be the new normal over here. 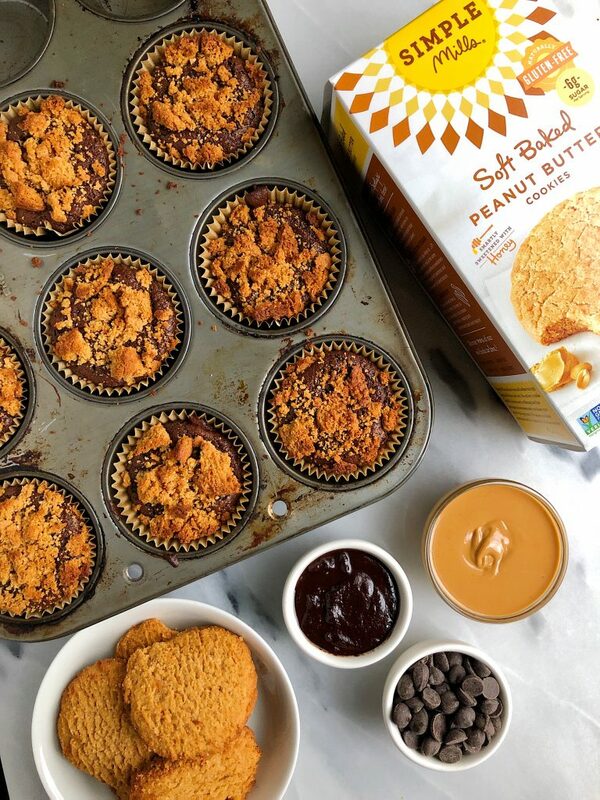 On top of the brownies, I used my absolute favorite soft-baked cookies from Simple Mills. Their Soft-Bake Peanut Butter Cookies have been my #1 love for about a year now since trying them in an ice cream sundae in California for Expo West. I ate my friend’s dessert at dinner because she was full and I was that obsessed with them. These are hands down the softest store bought cookie I have ever had in my life and the ingredients are on point. Almond flour, sweetened with honey and they use all wholesome ingredients like coconut oil and everything you can pronounce! It is crazy to think I have been partnering with Simple Mills for over 3 years now but they are truly such a game changing brand. I swoon more and more over their goods everyday. I gently crumbled a box of the peanut butter cookies on top of the brownie cups half way through baking time. They even had a little extra crunch on top and the peanut buttery flavor is too die for! I cannot wait to hear what you guys think of this recipe. Don’t forget to share with me over on Instagram if you make these Grain-free Peanut Butter Cookie Brownies. Allow them to cool for a few then enjoy! 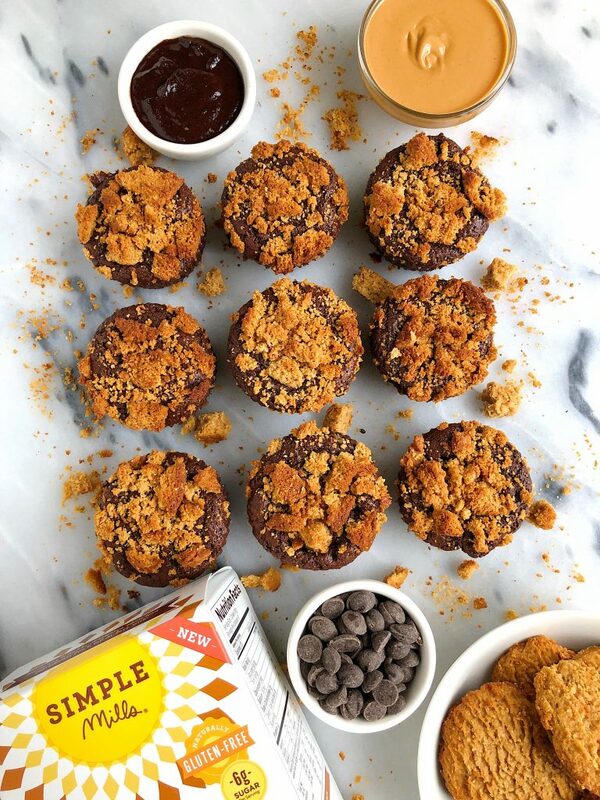 Thank you Simple Mills for sponsoring this post!